Fandango’s exclusive preview of the highly anticipated Lionsgate release shows Finnick (Sam Claflin) surprising Katniss (Lawrence) and Gale (Hemsworth) moments before Boggs (Mahershala Ali) and Cressida (Natalie Dormer) announce their plan to invade The Capitol — something the rebels have been planning for a long time. “You are to be on screen faces of the invasion, the star squad, it’s been decided that you are most effective if you are seen by the masses,” Cressida says to the group, and Katniss, a.k.a. the Mockingjay, clearly is not too happy about it. “You are considered high-value targets to The Capitol,” says Boggs before he shows the group a hologram of The Capitol while highlighting the possibility of its dangers. “Ladies and gentlemen, welcome to the 76th Hunger Games,” Finnick tells Katniss before the clip fades to black. “Mockingjay – Part 2,” the blockbuster franchise’s final installment hitting theaters on Nov. 20, stars Lawrence, Hemsworth, Claflin, Josh Hutcherson, Dormer, Ali, Woody Harrelson, Elizabeth Banks and Donald Sutherland. This teaser poster was released on July 8, showing Katniss in a blood-red costume sitting on an ivory chair. Katniss Everdeen (Jennifer Lawrence) is decked out in warpaint for the revolution. 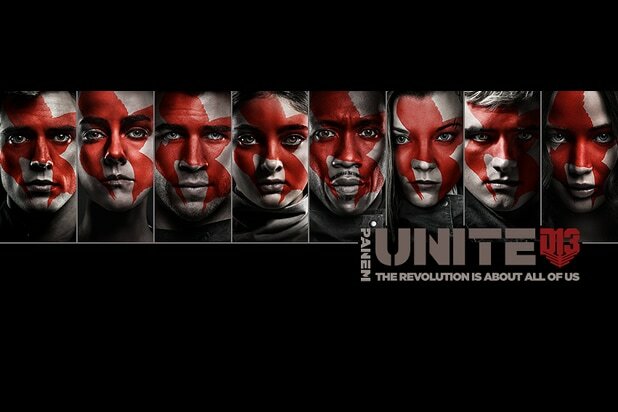 Gale Hawthorne (Liam Hemsworth) is decked out in warpaint for the revolution, with the caption, "Brothers Unite." Peeta Mellark (Josh Hutcherson) is decked out in warpaint for the revolution, with the caption, "Sons Unite." Johanna (Jena Malone) is decked out in warpaint for the revolution, with the caption, "Rebels Unite." Boggs (Mahershala Ali) is decked out in warpaint for the revolution, with the caption, "Soldiers Unite." Primrose Everdeen (Willow Shields) is decked out in warpaint for the revolution with the caption, "Sisters Unite." Cressida (Natalia Dormer) is decked out in warpaint for the revolution, with the caption, "Activists Unite." Finnick (Sam Claflin) is decked out in warpaint for the revolution, with the caption, "Husbands Unite." Liam Hemsworth stars as ‘Gale Hawthorne’ in "The Hunger Games: Mockingjay, Part 2"